1. The deaths of O’Neil’s parents, Miriam and Arthur, in the opening story, “Last of the Leaves,” haunt O’Neil throughout the rest of the book. When he and his sister, Kay, discover the credit card bill including the charge for the motel where Arthur and Miriam stopped on their fatal trip home, they are deeply disturbed, leading O’Neil to realize “how little he truly knew about his parents.” And O’Neil must come to accept that his parents’ lives were much more complicated and full of secrets than he had ever imagined. Was the accident that killed them completely an accident, or was it, in some way, an inevitable consequence of choices made? How do secrets kept and secrets shared figure throughout the stories in Mary and O’Neil? 2. Among the pivotal events of Mary and O’Neil are Miriam and Kay’s breast cancer; Mary’s abortion and later, the birth of her daughter, Nora; and Kay’s discovery of her husband’s infidelity. As a man, is Justin Cronin able to understand and convey with honesty and accuracy, the thoughts, emotions, details and reactions of his women characters to these quintessentially female experiences? 3. 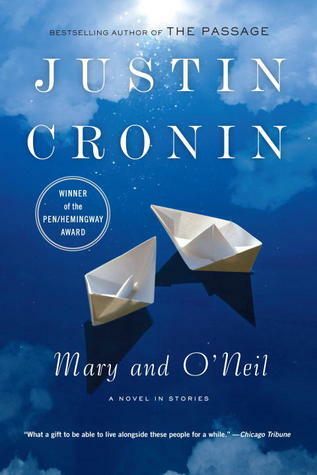 In the story “Orphans,” Cronin describes how O’Neil and Kay return to their childhood home to settle their parents’ affairs after the car accident. Cronin writes, “the weeks following their parents’ death passed quickly and became, for O’Neil, a time of strange and unexpected contentment . . . with each trip to the Goodwill box behind the Price Chopper, each final phone call to a bank or loan company, he felt his parents becoming real to him in a way that they had never been in life. More than real: he felt them move inside him.” As he gets older, does O’Neil become increasingly like either one, or both, of his parents? Is his marriage to Mary a mirror of–or a contrast to–Arthur and Miriam’s relationship? 4. Miriam and Kay had a difficult relationship. Miriam feels that she and her daughter never really got along, and describes Kay as indifferent to the rest of the family, withdrawn, self-absorbed and dismissive of Miriam. Mary, also, had a distant relationship with her mother. Compare the two mother-daughter relationships. 5. Are there similarities between Arthur’s feelings for Dora in “Last of the Leaves” and O’Neil’s brief encounter with Patrice in “Orphans?” Do these two romantic episodes indicate ways in which father and son are alike?